Curing diabetes with stem cells? Everyone knew that would be hard. Parkinson’s disease? Harder. Alzheimer’s? Probably impossible. But age-related macular degeneration, a major cause of blindness? That was supposed to be low-hanging fruit. The cause of AMD is well-known, the recipe for turning stem cells into retinal cells works like a charm, and the eye is “immunoprivileged,” meaning immune cells don’t attack foreigners such as, say, lab-made retinal cells. Yet more than a decade after animal studies showed promise, and nearly eight years since retinal cells created from embryonic stem cells were safely transplanted into nine patients in a clinical trial, no one outside of a research setting (or a rogue clinic) is getting stem cell therapy for macular degeneration. That may change soon. Researchers in California expect to launch a Phase 2 clinical trial of stem cell therapy for age-related macular degeneration this year, while a team from the National Institutes of Health is not far behind: It is planning the first study in humans using what are called induced pluripotent stem cells, which were discovered 12 years ago and won a 2012 Nobel Prize. These cells (iPSCs, for short) are made by sending plain old adult cells back in time, biologically, until they’re like embryonic stem cells — but without the ethical baggage those cells carry. “This will be the first such study for iPSCs for any disease indication worldwide,” said Kapil Bharti of the NIH’s National Eye Institute. “When iPSCs were discovered in 2007, there was a lot of hype that we could easily turn them into therapies. But there were many unanswered questions” about how to safely make transplantable cells, questions that are only now being answered. “I hope this reignites the field,” Bharti said. He and NEI colleagues reported in Science Translational Medicine on Wednesday that they had used retinal cells created from human iPSCs to treat a form of macular degeneration in rats and pigs, with results promising enough that they hope to start recruiting macular degeneration patients for a clinical trial in the next few weeks. That sets up a face-off between two forms of stem cells. In their trial, scientists at the University of Southern California are starting with stem cells derived from human embryos. Advanced “dry” age-related macular degeneration is a leading cause of blindness among people older than 50, affecting about 11 million people in the U.S. There’s no effective treatment. It’s caused by the death of retinal pigment epithelial cells, which form a nutrient- and oxygen-rich layer in the eye that keeps the rods and cones alive. When RPE cells die, due to age or high blood pressure or smoking or other causes, so do those photoreceptors, resulting in blindness. In the NEI study, scientists led by Bharti started with blood-making cells, called CD34+ cells, isolated from the blood of three AMD patients, and then turned them into iPSCs. They added growth factors and other biochemicals that shape the cells’ destiny: Although pluripotent cells can become any type of cell in the body, the specific combination of biochemicals produces one and only one. Bharti and his team created retinal pigment epithelial cells, the kind that die early in macular degeneration. Each batch took about 11 weeks. The idea is that replacing the dead and dying RPE cells “will stop these photoreceptors from dying and stop the disease from getting worse,” said Bharti, who with two co-authors are inventors on a patent application for generating retinal cells from iPSCs. Saving RPE cells wouldn’t bring photoreceptors back from the dead, and restore lost vision. But he and his team are already developing an AMD therapy combining photoreceptors with an RPE patch. That could actually cure AMD blindness. 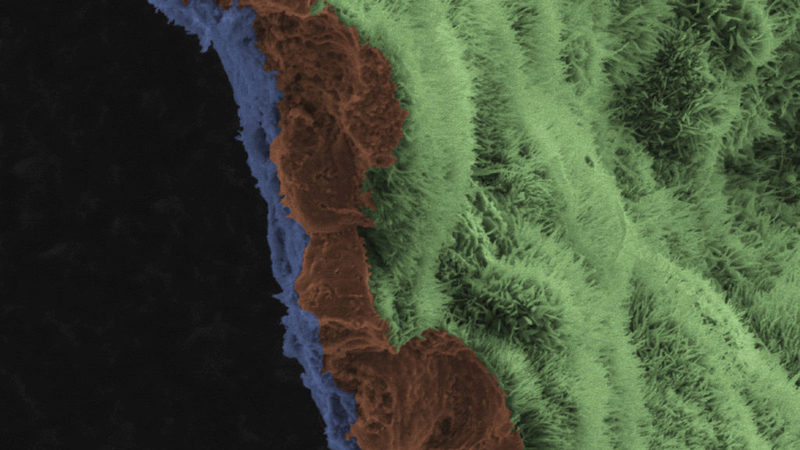 Although a prominent 2011 study injected droplets of retinal cells created from embryonic stem cells into nine AMD patients, Bharti did it differently, growing the cells in monolayers on a biodegradable scaffold. Carefully slipped between the retinal pigment epithelial cells and the photoreceptors of rats and pigs with a version of macular degeneration, the scaffolds melted away and the cells (about 2,500 for the rats, 100,000 for the pigs) integrated within the retina better than cells in injected droplets did. They did not, however, test the animals’ vision. Nevertheless, other researchers are also going the patch route. A London-California team reported last year that two AMD patients who received a patch with a monolayer of retinal pigment epithelial cells (produced from cells taken from human embryos, not adult cells) experienced no serious side effects. After a few weeks, one patient could see an additional 21 letters on a standard eye chart and the other could see 29 more. At USC, Humayun and his colleagues transplanted RPE-covered scaffolds into four AMD patients, with no red flags over safety and with hints that it might improve vision, they reported last year: With one eye, one of the patients could see 17 more letters on the standard eye chart than before. The USC team plans to launch a Phase 2 clinical trial this year, Humayun said. One worry about cells produced from induced pluripotent stem cells is that some of the iPSCs might not become specialized cells in the biochemical bath. Pluripotent stem cells can grow into tumor-like teratomas. But the NEI team got up to 96 percent of the stem cells to differentiate into RPE cells, and detected no such problem. Nor did they find cancer-causing mutations in the induced pluripotent stem cells, something scientists warned about in 2017. One remaining concern is that the same underlying cause of a patient’s original macular degeneration might also doom the transplanted cells. But since it took decades for disease to appear the first time, Bharti said, a cell therapy at age 60 or 70 has a good chance of lasting the rest of a lifetime. If the clinical trial gets promising results, he said, NEI will look for a commercial partner to move the therapy forward.